Alfred Waud evidently had ample time to study the enemy's works in front of Fort Sedgwick as he produced a number of sketches and details from there. He also appears (from his annotations) to have been present when the Ninth Army Corps assaulted at dawn of April 2, 1865, overran Confederate Batteries 25 and 27, and then held the ground against repeated desperate counterattacks during the day. Waud depicted the intricate appearance of the chevaux-de-frise obstacles and sketched their use by the Federal attackers, who broke apart the the prickly hedges, heaved them onto their shoulders, and deposited them chaotically beyond the batteries to defend their own captured ground. These events were described as happening at "Fort Mahone" or "Fort Damnation," which generally referred to the salient that wrapped around and across Jerusalem Plank Road; this would include Batteries 25,26, and 27, and Fort Mahone proper, as well as the heavy Columbiad Battery in the rear. None of the sketches (or photographs) were from within "Fort Mahone" proper, a detached outwork a quarter mile west of the plank road. LC 20300. 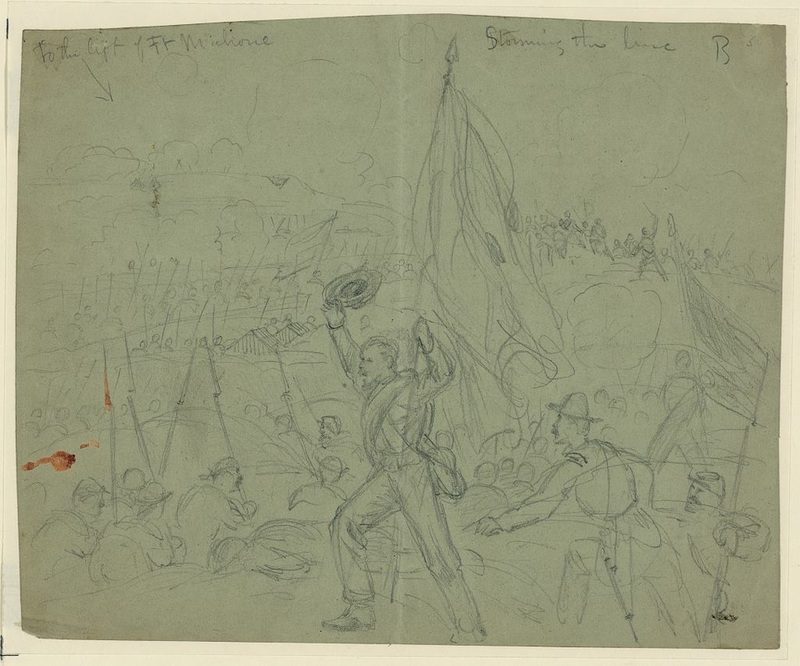 "Ft. Malone," drawing by A. R. Waud, showing assault of April 2d, 1865. 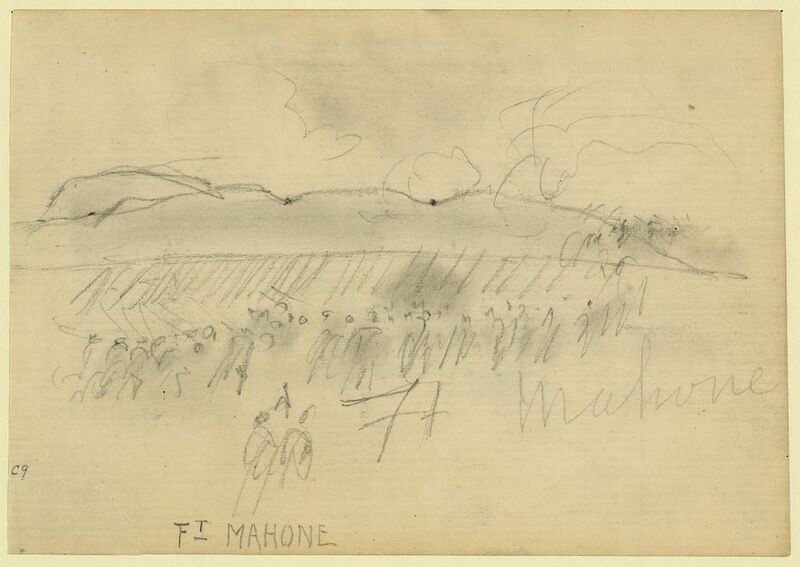 "9th Corps attacking Ft. Mahone better known as Fort Damnation," drawing by A. R. Waud [DRWG/US - Waud, no. 428 (A size)] "Inscribed below title: It was not daylight; but a good many dead and wounded. Men rushing over the enemies line. Inscribed vertically right margin: cheveaux de frise etc. Inscribed upper right: Have no time to finish this." 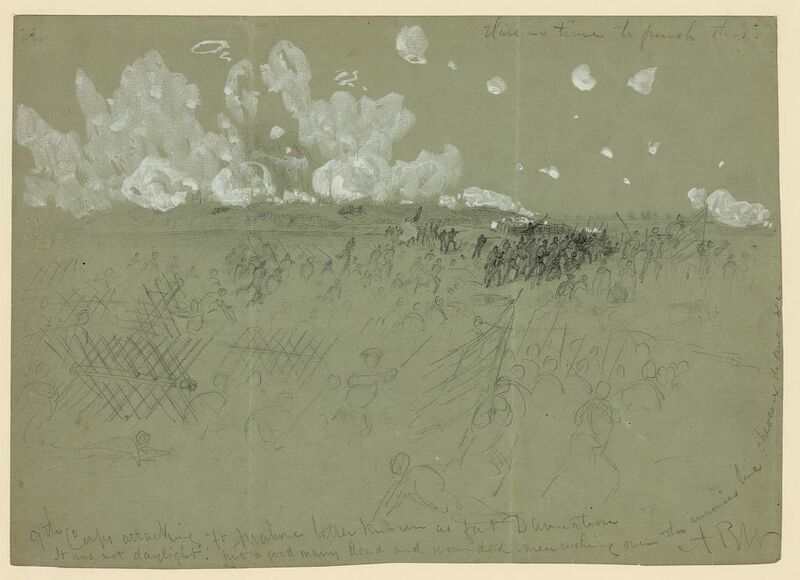 "9th Corps attacking Ft. Mahone better known as Fort Damnation," drawing by A. R. Waud. Inscribed below title: It was not daylight; but a good many dead and wounded. 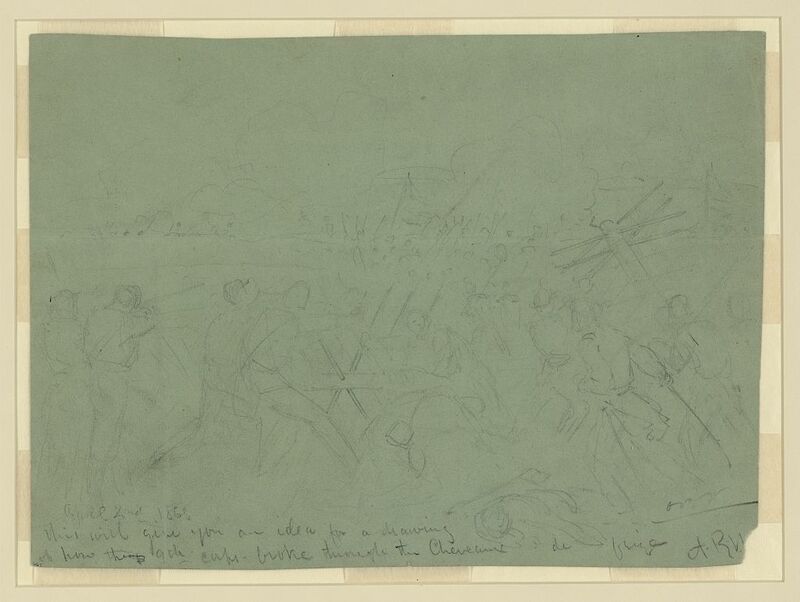 Men rushing over the enemies line." Inscribed vertically right margin: "cheveaux de frise etc." Inscribed upper right: "Have no time to finish this." 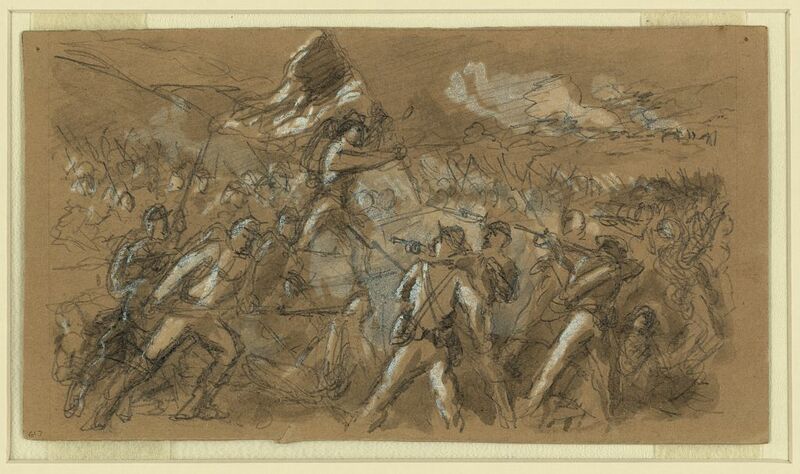 "Capture of Petersburg," drawing of the attack of the 9th Army Corps along the Jerusalem Plank Road, April 2, 1865, by Alfred R. Waud. Library of Congress. 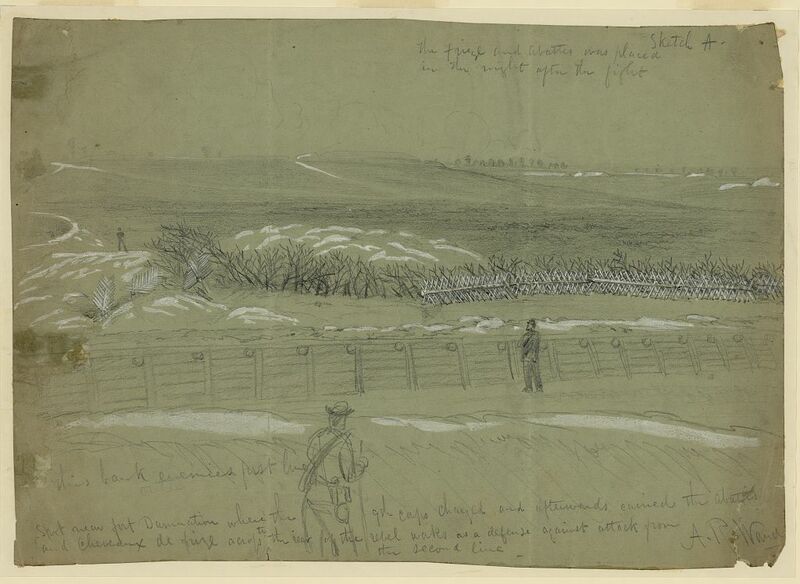 "Storming the Line, to the Left of Fort Mahone," drawing by Alfred R. Waud. Photographs taken on the day after the fighting here capture the attackers' reuse of the chevaux-de-frise.